This upcoming weekend, five Nak Muays, or Muay Thai fighters, from Renzo Gracie Academy in NYC will depart to one of the most reputable Muay Thai tournaments in North America, the REVGEAR Tournament of Champions. What's notable about this endeavor is that four of the competitors are female. In the customarily male-dominated world of martial arts and combat sports, it's clear that women are claiming their space. The Iowa-based competition will be hosting athletes from over 40 countries and territories. Sanctioned by the Thai Boxing Association, it focuses on the traditional aspect of Muay Thai over Westernized kickboxing. Hailing from Thailand, Muay Thai is often referred to the as the "Art of 8 Limbs", for its usage of knees, elbows, punches, and kicks. Kickboxing solely uses the hands and feet, and does not allow the infamous clinch that regularly appears in Muay Thai fights. Sylvie von Duuglas-Ittu is one such writer and competitor. Creator of 8Limbs.Us, von Duuglas-Ittu is extraordinarily unique, as she currently resides in Thailand and has fought over 150 times. Additionally, her website is constantly and consistently updated. It is a well-known resource for information. Considered a farang (Thai for foreigner), Sylvie has some of the most fights in Thailand out of any individual from the West. While women are still not allowed to compete at the Lumpinee Boxing Stadium, a national stadium of Thailand and the epitome of Muay Thai, von Duuglas-Ittu believes the martial art is becoming more progressive. She states, "In Thailand it seems like there is a steady rate of young women in the sport, especially now leaking into the middle and upper classes for fitness. It's very exciting, although the path to equality is still pretty long. As for women competing at Lumpinee, it seems like the more liberal the sport gets by including women, the more conservative the "traditionalists" need to get and double-down on their exclusion. There is a stadium near me that is kind of known for having very un-traditional scoring and cater to an "international audience" with fights that are more of a show, but they made a big deal about excluding women (after having allowed me to fight there) in order to appear more legitimate. I do believe things are changing, but it's a slow change. But it's exciting to be part of the path toward those changes, which every single woman who steps in the ring is part of." Another prominent Nak Muay, Melissa Ray, agrees. Ray was a professional fighter and world champion, and competed on the Queen's Birthday several times. She also manages a website called MuayThaiOnTheBrain.com, and lives in Thailand. As a four-time world champion, Melissa has seen the volume of women increase over the years and is excited to see what is coming next. 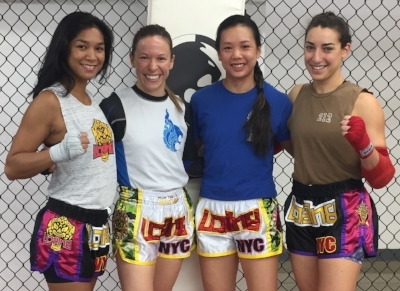 Ray has found that, "Female Muay Thai is growing hugely, in Thailand and overseas. The number of women participating in the sport has increased and women are also headlining events. I recently spent an afternoon at the IFMA World Youth Championships and was amazed at the number of girls competing, so the future is bright. In Thailand, I’ve noticed many more women training Muay Thai for fun and fitness, with no intention of ever competing, showing that the sport can be enjoyed by all. I would even say it’s become quite fashionable in recent years. Although women are still unable to compete at Lumpinee, I think it’s a matter of time before that changes. Now we have a female promoter organizing events at the stadium so mindsets are changing." As more academies and gyms appear every day, there are also more opportunities for men and women alike to actually begin training. The Renzo Gracie Muay Thai program is one such academy. Originally established in 2006 by head coach Joseph Sampieri under Brazilian JiuJitsu legend Renzo Gracie, the academy fosters and encourages a strong female presence. Coach Anne Lieberman is one of the competitors fighting at the REVGEAR tournament this weekend, and competes on a regular basis. Her teammates Michelle Diaz, Danielle Rind, and Michelle Yee are all cornerstones of the fighting program and well-known through the academy for their determination, hard work, and even harder punches. It appears that with every progressive fight camp, another woman has joined their ranks. Each woman has their own reason for training the martial art. Danielle attributes it to her mother. She says, "My parents, especially my mom, taught me that I could do anything boys could do. I think that really stuck with me and as a result I've always had a tendency to gravitate toward non-conventionally female or feminine hobbies; like combat sports. I stuck with Muay Thai in particular because of how endlessly challenging it is. Every fight is unique, even every day on pads is unique. You hit walls, you relish in break-throughs, but no matter what your mind is always working. To me, Muay Thai is fun, sometimes it's exhausting, but it's certainly never boring. Fighting is hard! Physically, mentally, and emotionally. I continue to do it because working towards that goal, sweating with teammates, and being lucky enough to have a group of coaches supporting you is an experience like nothing else." As the world of martial arts continues to rapidly expand, it is the work that these women do that contributes to the growth of females within sports. The struggles of day-in and day-out of training alongside maintaining full-time careers and other responsibilities can be overwhelming for many. Their dedication and advancements are made all the more prominent. It seems that with each passing day, more and more women are wrapping their hands, putting on gloves, and pulling on Thai shorts. It's definitely a good thing.